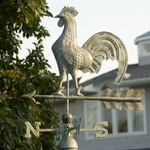 Enjoy our most popular selection of Rooster Weathervanes, perfectly sized and available for all home and gardens, garages, barns, gazebos, cupolas, and even commercial buildings. 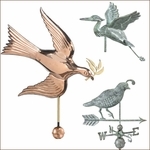 Each of our Rooster Weathervanes are handcrafted from copper and brass by skilled artisans and include brass directionals, copper spacer balls, and a rust-free stainless steel assembly rod making them completely rust and maintenance free! In addition, we now also offer more affordable Steel Weathervanes too! 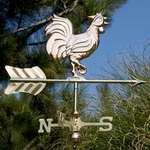 Stop blowing aimlessly in the wind; take yourself one of these magnificent Rooster Weathervanes home today! Many available in multiple finishes, and certain to add that rooster loving touch to your home and garden. 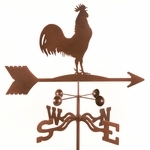 Please allow 2-3 days shipping time on all Rooster Weathervanes.